The area most popular with tourists, Centro Storico (prime area) features many of Rome's most famous sights: the Colosseum, Palatine Hill, and the Roman Forum. It also has fine renaissance palaces and masterpieces by Michelangelo and other great Italian artists. In the side streets, usually close to the main attractions, there are many cafes, and the nightlife is lively. Since new buildings cannot be built in this part of the city, the available housing is often somewhat rundown. Nevertheless, apartments in Centro Storico are greatly in demand. Just west of the Park of the Villa Borghese lies the district of Spagna, named after the Piazza di Spagna, where the the Spanish Embassy to the Holy See is based. 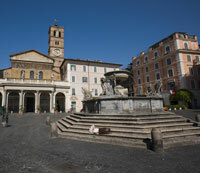 The piazza is famous for the monumental Spanish Steps that date from the 17th century. In May, the Spanish Steps are decorated with bright azaleas, making for an especially alluring spectacle. The flight of 137 steps leads up to a smaller square graced by the lovely Baroque church of Trinit� dei Monti, from where you can get a marvelous view of Rome. The Spanish Steps are often used as a meeting place, and are frequently crowded. 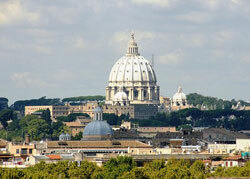 Spagna is quite a busy district, and one of the trendiest and wealthiest areas in Rome. Some of the city's swankiest restaurants, espresso bars, and fashion boutiques can be found in Spagna. It is a good place in which to shop for designer goods. Nearby, the Via Bocca di Leone market sells fresh fruit, vegetables, and fish. The district was favoured by English expatriates throughout the 18th and 19th centuries; they left their mark with some very long-lived cafes as well as the Keats-Shelley Museum. Trastevere has a reputation for being the "most Roman" part of Rome. It is the place to find a slice of traditional Roman life; in this quiet residential district, old gossips sit outside their homes, underneath hanging laundry lines. Walking down the narrow cobblestoned streets in the shade of elegant, high-windowed apartments with warm, terracotta fa�ades, you could almost imagine you were back in Renaissance Italy - if it weren't for the ubiquitous Vespas and the occasional Fiat you'll come across. The small artisan studios and colourful street vendors add to Trastevere's air of romance. Miraculously, modern chain stores have not invaded Trastevere, where instead you'll find cozy bookstores and traditional ceramics and crafts. A fresh food market takes place on Piazza San Cosimato, and a popular flea market is held Sundays at Porta Portese. As a nightlife destination, Trastevere has few equals in Rome. This district is jumping with lively pubs, cafes, jazz bars, and upscale restaurants. 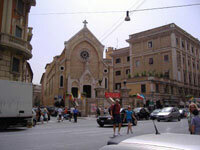 However, Trastevere has few hotels or tourist attractions. Its main landmarks include Santa Maria in Trastevere, a lovely 12th-century church with well-preserved mosaics; the Villa Farnesina, which features some of the works of Raphael; and the Orto Botanico, a botanical garden that provides a little bit of wilderness within the city. It is a simple matter to walk from Trastevere to the more popular tourist spots, and Tram 8 on Viale Trastevere can easily take you all around central Rome. Trastevere has recently started to attract foreigners who want a taste of everyday Roman life. Ironically, this "most Roman" of districts is gaining one of the larger expat populations in Rome. This was an elegant district in the 1950s and '60s, about the time Via Vittorio Veneto was immortalized in the Fellini film La Dolce Vita. The film captured the glory days of the neighbourhood, when it was the playground of the leisure class and the haunt of celebrities like Frank Sinatra and Anita Ekberg. Since then it has lost much of its glamour, and many of its fine buildings have been converted into offices. Harry's Bar (seen in Fellini's film) still exists, though; it's a pricey, upscale bar occasionally visited by celebrities. While Via Veneto is known as a shopping district, its boutiques are exceedingly expensive and not exactly on the cutting edge of fashion. Affluent travelers still favor the area, though, as some of Rome's finest hotels are based here. It is also the address of some of the most expensive restaurants in Rome. Aventino is one of the celebrated seven hills on which Rome was founded. It has a number of notable tourist attractions, most famously the Piazza Bocca della Verit�, where you can find a couple of elegant Roman temples as well as the old church of Santa Maria in Cosmedin with its towering campanile. And of course, it has the Bocca della Verit� (Mouth of Truth), housed in the portico of Santa Maria church. The piazza actually lies at the foot of the hill; on climbing Aventino, you will discover a wealthy and elegant residential neighbourhood festooned with private gardens and tranquil parks. It's a a pleasure to walk around and see the ornate villas, the spartan yet impressive 5th-century basilica of Santa Sabina, the lovely Municipal Rose Garden, and the enchanting Parco Savello, also known as the Garden of Oranges. To the southeast, just past Piazza Albania, is Little Aventinus, the secondary peak of the Aventine hill. It is usually called San Saba, after the endearingly rustic medieval church that graces the district. San Saba went through residential development in the early 1900s. The houses that were constructed are blocky yet charming affairs, set amidst much greenery. More houses were built at the foot of the hill in the 1930s; most of these are modest in appearance, although a few are actually very beautiful. While Aventino is primarily a residential area, S. Saba has a few stores selling everyday necessities, and is also home to St. Stephen's International School. A popular fresh-food market is found nearby in Testaccio, just southwest of Aventino. Testaccio is also full of highly traditional Italian restaurants as well as trendy nightclubs - it's one of Rome's liveliest nightlife areas. Esquilino is the neighbourhood perched on the Esquiline Hill (one of the Seven Hills of Rome), just south of the Termini, Rome's main railway station. It is a noisy but convenient location, where you will find a large variety of shops, some low-priced supermarkets, and the Mercato Esquilino, an indoor market that sells meat, fish, clothing, and many cheap goods. This long-enduring market used to be based outdoors on Piazza Vittorio Emmanuele II, the largest piazza in Europe. The piazza has a garden at its centre, where you can stroll or take the children out to play. Fine-looking Stile Liberty (Art Nouveau) buildings - most sadly needing restoration - can be found in the streets surrounding Piazza Vittorio. Those who love old churches will be drawn to Esquilino's Santa Maria Maggiore, a magnificent 9th-century basilica (though it has gone through later reconstruction). While many Italians still reside in Esquilino, the place is on its way to becoming Rome's Chinatown. You'll find a lot of Chinese and Indian restaurants along its streets, although traditional trattorias maintain their presence. For a more Roman feel, visit Colle Oppio, the adjoining hill and park that houses the ancient Baths of Trajan and the Domus Aurea, a villa that was built for Emperor Nero. Take note that it's not safe to be in the park or on the streets near the Termini are at night. Campo de' Fiori is a square close to the Piazza Navona. This is one of Rome's liveliest quarters and possesses a bit of a Bohemian atmosphere - perhaps not surprisingly, since Charles IV of Bohemia briefly stayed in a house near here, according to legend. Campo de' Fiori is primarily a market square with many flower and fresh food vendors; at night it is vibrant with bars, cafes, pizzerias, and trattorias. The picturesque square is surrounded by narrow cobblestoned streets, which are surprisingly tranquil and private in comparison. These elegant streets are lined with small apartment buildings, craft shops, clothing stores, bookstores, and cafes. Monti is set upon one of the Seven Hills where the city of Rome was born. It is one of Rome's oldest neighbourhoods and the home of many great monuments, notably the Colosseum. Despite being near some of the popular sights, this is a quiet, unassuming district. Monti has the feel of a traditional village, complete with a delightful little market. It has apartment buildings dating back to the 1930s, small traditional restaurants and shops, and a few parks. There is good public transportation, making up for the fact that it is hard to find parking space. This is where you can find the landmark Trevi Fountain where Anita Ekberg famously waded in Fellini's La Dolce Vita. It draws many tourists, and there is a lively crowd here at night. The sublime church Santa Maria Maggiore is here too. Trevi is a tourist haven but still an elegant district lined with shops, trattorias and espresso bars.